a pillar of cloud, among other things, on the platform. It is this camel I want to focus on. This was one bad camel. Its eyes moved. It wore a genuine camel saddle. And it could take the weight of a full grown adult sitting on it – which their Pastor proved to them one Sunday during his sermon. She took a saddle stand for the body – which explains why an adult could sit on it. 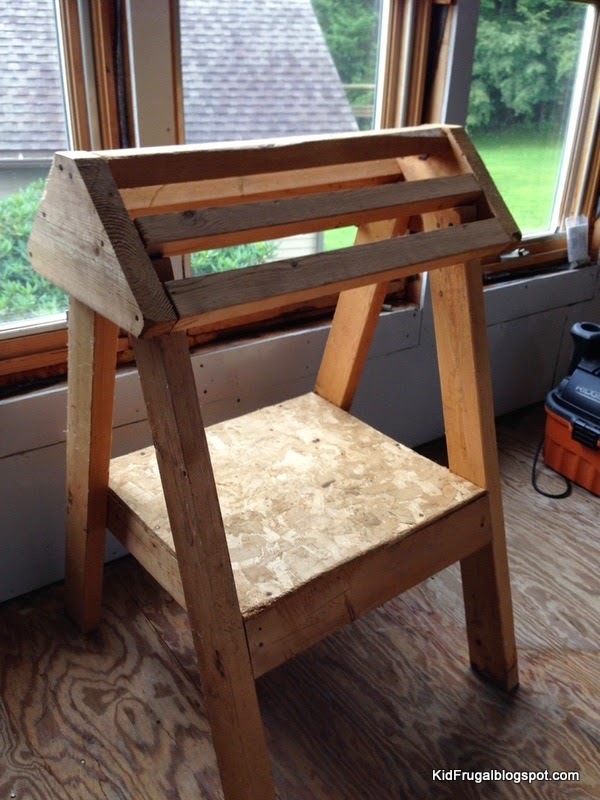 She had her husband attach some 2 x 4’s to the stand to create the chest, neck and hind end. 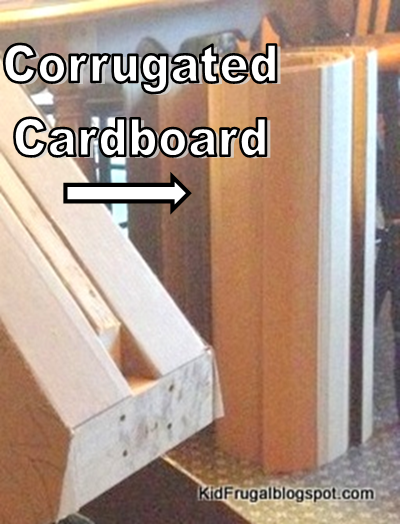 Then she added cardboard, as you can see from the pictures. 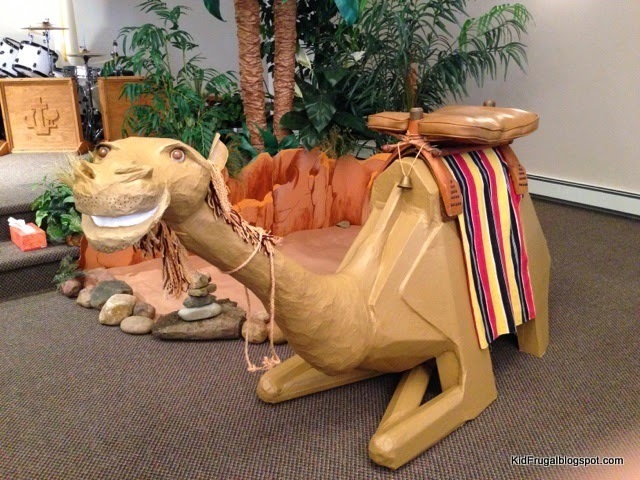 The corrugated roll was used on the camel’s legs and neck to get the round shape. Flat cardboard was used to make the hind end. 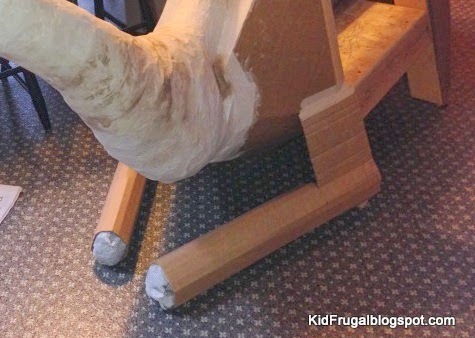 You can see that she stuffed the cardboard legs with newspaper to give strength, and to make the rounded knee joint. 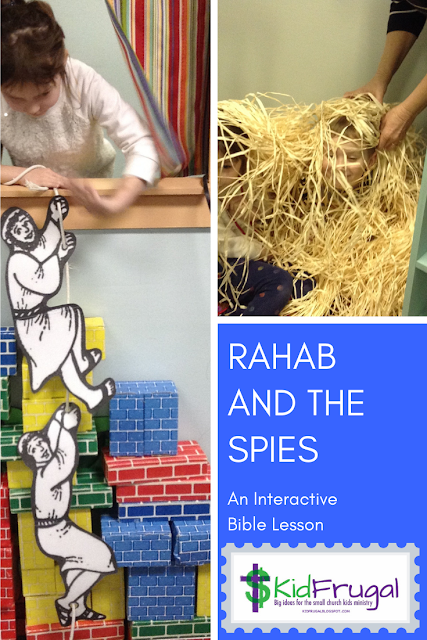 Things were held in place with masking tape until everything could be paper- mâchéd over. When the paper-mâché dries it is very hard and will hold. To get the head and face, she shaped chicken wire into the shape she wanted and stuffed it with newspaper. The eyes are her pièce de résistance. Can you guess what she made the eye balls out of? They even move! She used the rollers from roll-on deodorant. 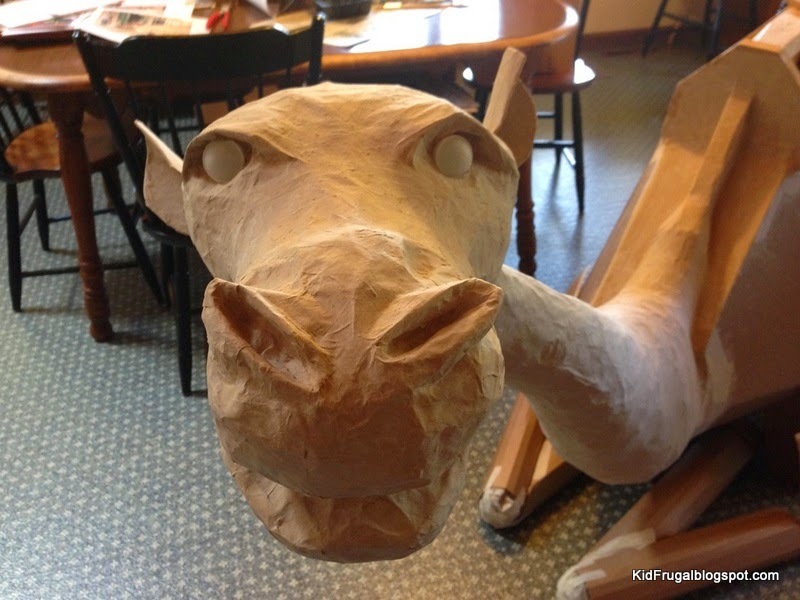 The ears are just pieces of cardboard attached to the head and then paper- mâchéd over. She paper- mâchéd over the entire body once it was all shaped. It takes quite a while for this process as you need to let the layers dry before you put more on. Done properly, it will be very sturdy. So there you have it, how to make your very own camel. 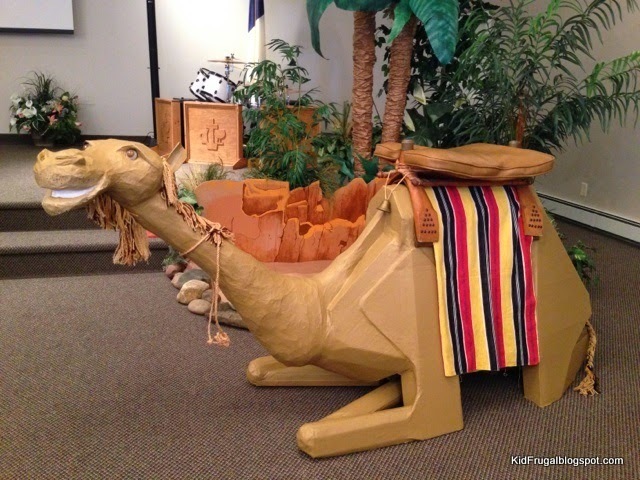 Someone had a real camel saddle that this church borrowed. 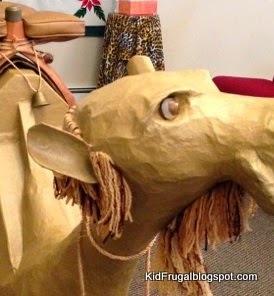 I am told that more people have camel saddles than you might think. 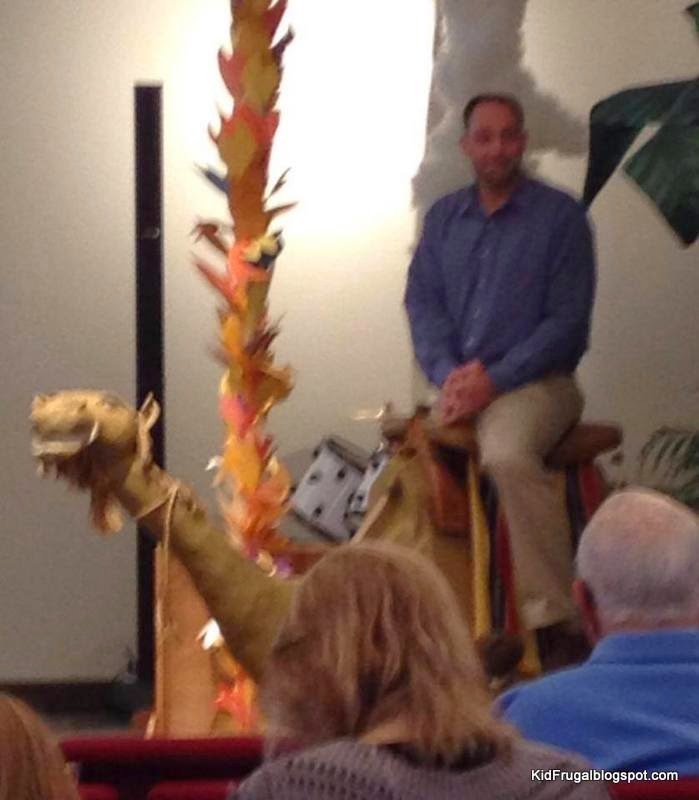 You don’t have to have a saddle, unless you want your Pastor to ride it some Sunday morning. A saddle might make it easier for him. 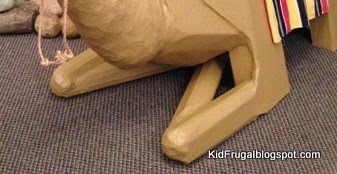 You can make just about anything with paper-mâché. Just be bold and start doing it. If you are using newspaper – it rips in longs strips when you tear it top to bottom. If you try to tear it side to side, you get lots of little pieces. Sometimes little pieces are good, but they take forever. Just saying. If you are making something that you plan to keep for any length of time, add some essential oil to your mix to keep it from molding later. Oil of lavender or tea tree oil are good choices. Be patient and plan ahead. This project took about a month to do. You can do projects faster, but you need to plan for the drying times between layers. And just in case you didn't believe me, here is the Pastor caught in the act, albeit, a blurry catch.